Power Ledger (POWR) has been one of the best performing cryptocurrencies this week despite no market-sensitive news or “shilling” from the project itself. Power Ledger (POWR), the government-backed Australian token, is quickly becoming a must-watch project, with actual utility and value, unlike most tokens with baseless hype. The recent rise has not been driven by Twitter or Reddit gossip and Power Ledger has working trials happening right now all around the world. Origin Energy, one of the energy titans of Australia, is also set to release results of an independent trial of the technology soon, which many believe is driving the buying behavior. So What is Power Ledger? Power Ledger aims to facilitate the peer-to-peer trading of power, using micro-grid set ups which support major grids, but can work independently as well. Imagine a neighborhood, all equipped with solar panels. These houses could produce, store, and trade electricity based on their needs. Some houses would need extra, and some would have a surplus. A world-first public trial for 80 homes, involving the trading of water and electricity without support from a major grid, is about to commence in Fremantle, Western Australia. Private trials are also being conducted all over the world and are being driven by Origin Energy and Tech Mahindra in India. Power Ledger could, ultimately, result in much cheaper energy for everyone; and given how 79% of the third-world does not have access to electricity, the Power Ledger project could really make a difference. This is not an overnight success by any means, and the price support being witnessed now is due to a few reasons. The project ran their ICO in October last year, and raised $34 million AUD. 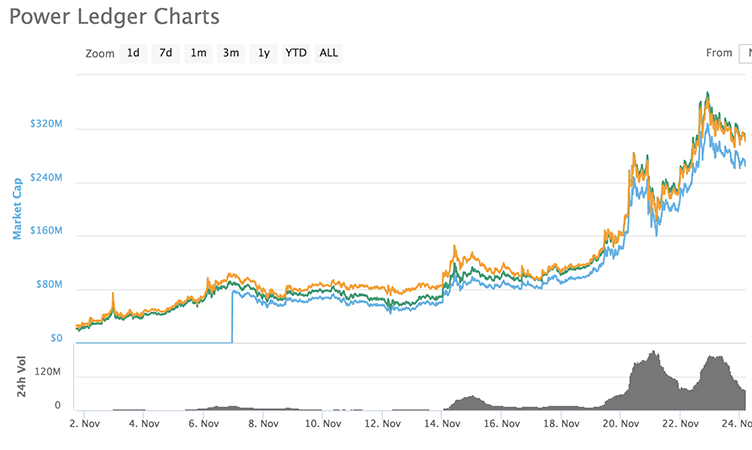 Once it hit the market, the token exploded, going from $0.056 on November 1, 2017 to above $0.91 later that month - a rise of over 1,525%. Yesterday, POWR went over $2 momentarily for the first time, and at the time of writing, is trading around $1.50, which still represents a considerable increase over the last 7 days. The Power Ledger project is backed by a very impressive team, chaired by co-founder Dr. Gemma Green (PhD), who is also the acting Lord Mayor of Perth. Managing Director David Martin also has over 20 years of experience within the electricity industry and has held executive positions in two state-owned electricity utility companies. They are also advised by legendary Silicon Valley venture capitalist Bill Tai. Most important of all, however, is that they have a working product. Vlad Zamfir, one of the core Ethereum developers even mused on Twitter recently that almost no crypto projects have working products. This is a significant separator for Power Ledger, and the expected trial results will, if positive, set further developments in motion, leading the project to new heights.